Patagonia: The mysterious territory with wide open spaces, enchanting rainforests, bright blue glacier-fed lakes, charging whitewater rivers, archipelagos, and the Andes Mountains, all shared by both southern Argentina and Chile. To some of us, it's where RIDE Adventures was born back in 2010 (just moments after the photo to the right was taken,) and to others, Patagonia remains the very best riding experience they've ever had. Even though approximately 10% of the routes we ride in Patagonia are now being covered by pavement each year, the stunning attraction to this region will forever be preserved. The prepacked options listed on this page aren't the only arrangements we have to offer with our Patagonia motorcycle trips. We are completely aware that some of us prefer to ride solo, some with groups, and others just want to RIDE! As such, you just need to let us know via the Contact Form what would make your motorcycle adventure in Patagonia the perfect one, and with that information, we can either help you select from the pre-packaged options shown, or create a custom trip for your specfic wishes. Please also note that, much like with any of the locations we now provide such services, our rental motorcycles can be sold out for the dates you want to travel. As such, we always recommend confirming plans with us as far in advance as possible. 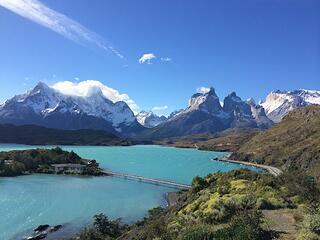 Especially in Patagonia, trip spots and motorcycle rentals can be sold out 6-8+ months in advance. Motorcycle trips in Patagonia will typically involve flying into Santiago, Chile (SCL) and possibly another regional flight within Chile to your adventure departure point. Duration: Patagonia tours are typically 10-18 days, depending on whether you'll enjoy some non-riding activities like world class rafting on the Futaleufu River, fly-fishing on the River Baker, or any of the other great outdoor sporting activities that make Patagonia so special. Also, including a finish in Ushuaia at that "End of the World" typically adds 2-4 days to your trip. Weather: Be prepared for anything, as Patagonia is ever-changing. In the same day, you could experience freezing temperatures, sunshine and warmth, and of course rain, depending on what area of Patagonia you're in. If your trip goes all the way to Ushuaia, you can end up seeing snow even in the middle of South American summer as it's only 700 miles from Antarctica at the "End of the World!" Tour Formats: Self-Guided "Fly & RIDE" packages, Guided Group Motorcycle Tours, and Self-Guided, Truck Supported trips. (Each tour page will explain "Inclusions" per package.) We also have 4x4 adventure travel packages in the Patagonia region too (as well as Chile, Argentina, and Bolivia), so you can bring your non-riding friends and family along! Seeping into Patagonia’s endless display of bright blue lakes and rivers, year-round snow-capped mountains, awe-inspiring glaciers, and bright green rainforests, it might seem like a motorcycle rider's paradise. Sites like Torres del Paine, The Perito Moreno Glacier, The Carretera Austral, and Mount Fitz Roy are all typically included in the Patagonia motorcycle tour routes we ride through, and if your goal is to reach Ushuaia at what is referred to as “The End of the World,” that can be the ultimate moment in your adventure! Some tours will included special "side trips" like boat tours, etc.